New York City has the highest concentration of Tibetans in exile living outside India and Nepal. The Dalai Lama’s current representative to the Americas, Lobsang Nyandak, estimates that at least 6,000 “bonafide” Tibetans live in the five boroughs today. The city is becoming increasingly important in the Tibet political activism space, with young Tibetans deploying creative means – from blogs to stand-up comedy to art installations to old fashioned protests to shame China. This is an excerpt from my Journalism School Masters project on the new wave of Tibetan activists in the city. Profiled below is Tenzing Rigdol, a contemporary artist who snuck into Tibet to bring back 20 tons of Tibetan soil for Tibetans living in exile. 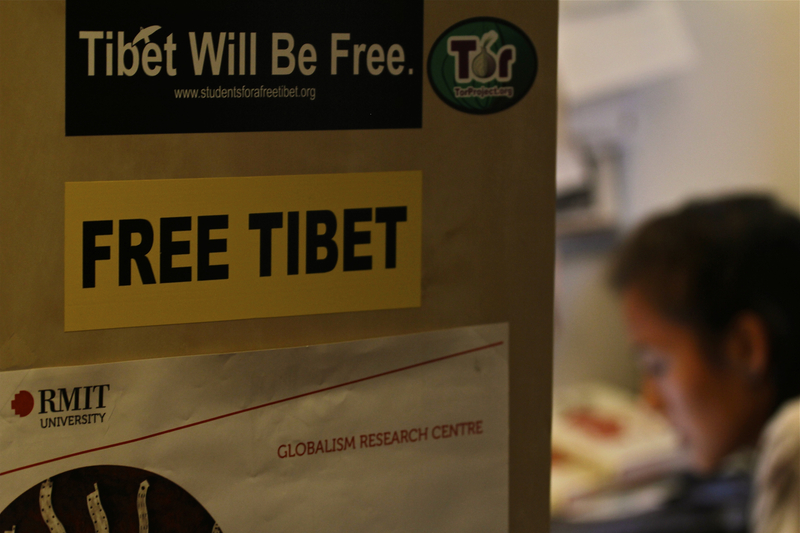 The Students for Free Tibet headquarters in New York is at the heart of the global movement for a Tibet free from Chinese rule. IT started with a white lie. His son, Tenzing Rigdol, a Tibetan contemporary artist with a growing presence in international art galleries, was thrown by the question. Rigdol was thrown by his father’s question. Like many Tibetan families, Wangdu’s had escaped Chinese rule that began Tibet in the 1950s and had since chosen to live in exile in India, Nepal, and finally, the United States. Rigdol had grown up having debates with his father about Tibetan religion, philosophy and life after death. But he knew that this wasn’t the time to argue. His father needed reassurance – even if it were a false one – that he would get to see his beloved homeland in his incorporeal form. “That was a strange question to ask. I think it was his existentialist moment. He was asking questions about his own life, where he was going to go,” Rigdol remembers, looking beyond the charcoal canvas that he has spread across his entire living room floor, almost seeing acutely the last few moments he had with his father. Wangdu seemed at peace with that. A few days later, after asking Rigdol to change his bedding, he slipped away to the other side. He was 65. Grief can unleash creative powers. Over the next few months after his father’s death, Rigdol reconciled his vocation, art, with his deep personal loss. His way of coming to terns with his father’s death would be unique: he would transport truckloads of Tibetan soil for Tibetans living in exile in India, where he would let them kiss, touch and walk on the soil they were fighting to walk on. If he couldn’t bring his father to Tibet, he would bring Tibet – in a tactile form – to other Tibetans. “Tibetans who are of my father’s and mother’s age always talk about visiting Tibet once before they die,” says Rigdol. But many find it impossible to return. In the case of Rigdol’s father, it would have been particularly perilous to return to his native country. “The Chinese government is very strict with Tibetans living in exile, particularly those who worked in a Tibetan army in India,” he points out. The fact that his father did not have American citizenship, which could have shielded him from Chinese oppression on his return to Tibet, was also a deterrent. Rigdol launched an ambitious – and dangerous – plan to smuggle 35,000 kilos of soil dug from deep inside Tibet into Dharamsala, India, home to nearly 150,000 Tibetans and the seat of the Tibetan Government in exile. Rigdol didn’t involve any Tibetans in Tibet in the project. “That was my first priority. I didn’t want to get them in trouble.” The project took seven months, 30 people, and driving hundred of miles through 56 check points over 18 days to be accomplished. Rigdol used about a dozen trucks to transport the soil, because he had to switch vehicles and license plates throughout the tortuous route. Finally, he managed to transport 20,000 kilos through rain and landslides. “It was very difficult but also very easy,” says Rigdol. Thousands of Tibetans came to his 43 feet X 43 feet soil exhibit spread across a stage on a basketball court in Dharamsala in October, 2011, titled, “Our Land, Our People.” They came with bags, bottles and buckets and took the soil away. The Dalai Lama, the spiritual leader of the Tibetan people, blessed it: inscribing the word ‘Tibet’ on it with a stick. Rigdol’s father would have been proud. Now back in New York, Rigdol is working on a documentary on his art installation and is continuing to paint political canvases. Sprawled across the living room floor of Rigdol’s two-bedroom apartment in Woodside is another art project: a painting inspired by the spate of self-immolations by monks protesting the Chinese occupation of Tibet. Twelve monks doused themselves with gasoline and set themselves aflame in 2011 alone. The painting is done in gray, to go with the color of ash, and had a burning monk interacting with five other figures drawn from Buddhist mythology. Rigdol has joined the ranks of young Tibetan activists in New York City, fighting what has long been referred to on bumper stickers and posters as the battle to “Free Tibet.” Like Rigdol, many Tibetans in the city are using a variety of creative means to attract global attention to the Tibetan cause – from graphic novels on the life of the Dalai Lama to blogs on how Tibetan culture can be used a political tool in the struggle for independence. The city has come of age as a leading center for Tibetan activism, with one of the largest concentrations of Tibetans outside Tibet. The access to the UN on 42nd Street and the Capitol on a Grayhound makes the city – and activists like Rigdol – indispensable in the Tibetan struggle for freedom from Chinese rule.